Let us be your Instagram tour guide. So you've just arrived at Waverley Station. Or maybe you arrived by air? Either way, you'll probably start your day at Princes Street: The city's main artery, home of Waverley Station and the drop-off point for the airport bus. If it's sunny, start your day in Edinburgh with a stroll through Princes Street Gardens. You certainly won't believe you're in the heart of a city. Peckish? Visit Valvona and Crolla's café in Jenners. Jenners is a historic department store on Princes Street with a cafe run by an equally iconic Edinburgh institution: Italian food merchants Valvona and Crolla. As you'd expect, their Italian coffee is heavenly and the cakes are amazing. Or for something a bit more substantial – and healthier – visit Urban Angel. If you missed breakfast, head to Urban Angel on Hanover Street. Their granary toast topped with avocado, broad beans, ricotta, and lime is particularly delicious, or you can opt for their more traditional eggs benedict. To burn off those brunch calories, climb the Scott Monument. You can climb this historic landmark's 287 steps for a bird's eye, panoramic view of the entire city. It will certainly help you get your bearings. Then stroll up The Mound towards the Royal Mile. The Mound is an artificial hill that connects the Georgian New Town to the medieval Old Town. Take a minute to appreciate the view of Ramsay Garden on your way up. Make sure you take a shortcut through Milne's Court. It's such a good photo opportunity. Need a bit of refreshment? Grab an ice cream or coffee from Burgers and Beers. You've got a castle to visit before lunch, so you need to keep your strength up. Head uphill, feasting your eyes on the amazing medieval architecture on the way. Castlehill is the most ancient part of the city, dating back to the 12th century. It's time for your first major attraction of the day: Edinburgh Castle. 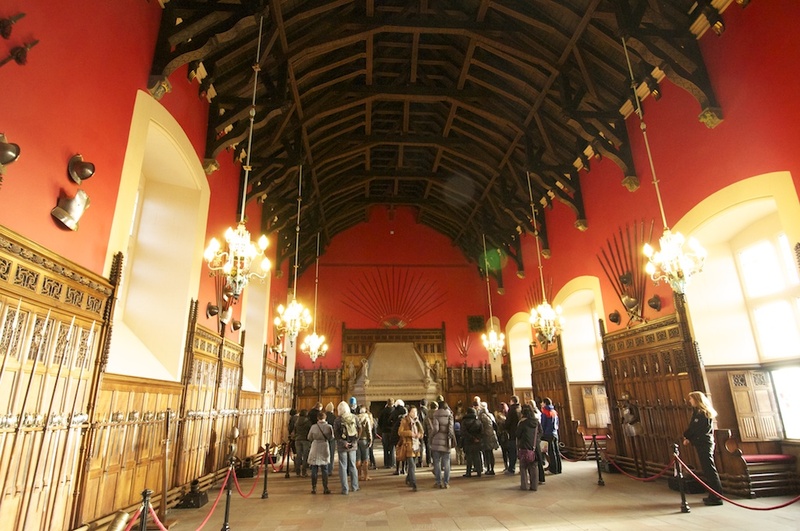 Edinburgh Castle is incredible, but remember, you're only here for a day so limit your visit to its top three sights: St Margaret's Chapel (the oldest building in Edinburgh), the spectacular Great Hall, and (of course) the Honours of Scotland. Time for a well-earned lunch, and where better to spend it than at The Elephant House? The "birthplace of Harry Potter" is just ten minutes walk from the castle. The Portobello mushroom burger with goat cheese and aioli is delicious, or, if you want the full Scottish experience, you could always opt for haggis, neeps, and tatties. After lunch, grab a quick selfie with Greyfriars Bobby. Bobby was an Edinburgh dog who spent 14 years "guarding" the grave of his owner in Greyfriars Kirk, although he probably just enjoyed the attention and free food. Or check out the iconic Old Town Bookshop. This beautiful shop on historic, colourful Victoria Street was established in 1978 and sells a range of antiquarian and second hand books, old prints and antique maps. Then head to the National Museum of Scotland. You won't have time to explore all of its nooks and crannies, but just being in the amazing, vaulted main gallery is a great experience. It's time to jump on a bus to the New Town. Head back to the Elephant House and get on a number 23 bus, which will whisk you back down the Mound to the New Town and the beautiful Charlotte Square. ...or visit the sumptuous Georgian House. The Georgian House was built in 1796 for the 18th Chief of the Clan Lamont. It's since been restored in lavish detail by the National Trust of Scotland to show how a typical Georgian New Town house would have looked. Sightseeing is thirsty work, so you should probably head to Panda and Sons. This hidden, 1920s speakeasy-themed bar on North Charlotte Street disguises itself as a barbershop and serves truly delicious cocktails. After that, take a stroll to the beautiful Dean Village. This historic area is just five minutes from Princes Street and is well worth a visit. It sits beside the Water of Leith and used to be home to several water mills. Keep strolling until you get to Stockbridge. The Water of Leith walkway takes you from Dean Village to Stockbridge, a particularly pretty part of the New Town that used to be an outlying village until it was incorporated into the city in the 19th century. While you're there, don't miss Mellis Cheese. Mellis's is an Edinburgh institution. The iconic cheese shop stocks a huge range of cheeses, including Scottish favourites Isle of Mull cheddar and Old Lochnagar. It's time for dinner, so head to Leith. Take a taxi to Leith, or hop on a number 36 bus. Leith was Edinburgh's port, and has a wide range of bars, restaurants, and cafes with lovely views over the water. It's a great place to watch the sun go down. If money's no object, book a table at The Kitchin. This Michelin-starred restaurant is run by celebrity chef Tom Kitchin. Tasting menus start at £65 and include dishes like this saddle of rabbit with roasted artichoke. If you're a fan of seafood, check out Fishers instead. This laid-back bistro by the waterfront serves fresh, reasonably priced fish dishes like these Scottish mussels in white wine, cream and garlic. Or grab some grub at a converted ferry terminal. Teuchter's Landing is a dockside bar that used to be the waiting room for the Edinburgh to Aberdeen ferry. It serves great value food like haggis stovies, kedgeree, risotto, mac and cheese, and mugs of chips. After dinner, head to Sofi's. This airy, friendly Swedish-owned pub near The Shore serves delicious cocktails and Idun's elderflower cider: The perfect pick me up after a big meal. Or, if you prefer a party atmosphere, round your day off with a trip to the legendary Port O'Leith bar. If you want an authentic Scottish pub experience (namely, people dancing on a table while singing Proclaimers songs) the lively Port O'Leith bar the best place to go, especially on a Saturday. Who knows, you might even make some new friends. Come back soon, and stay for longer next time.